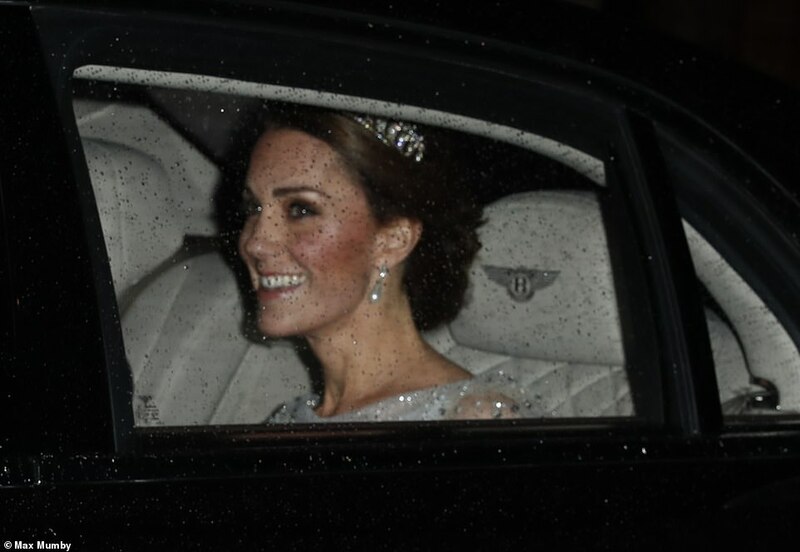 The Duchess of Cambridge dazzled in a tiara that once belonged to Princess Diana at a glittering Buckingham Palace reception on Tuesday night. 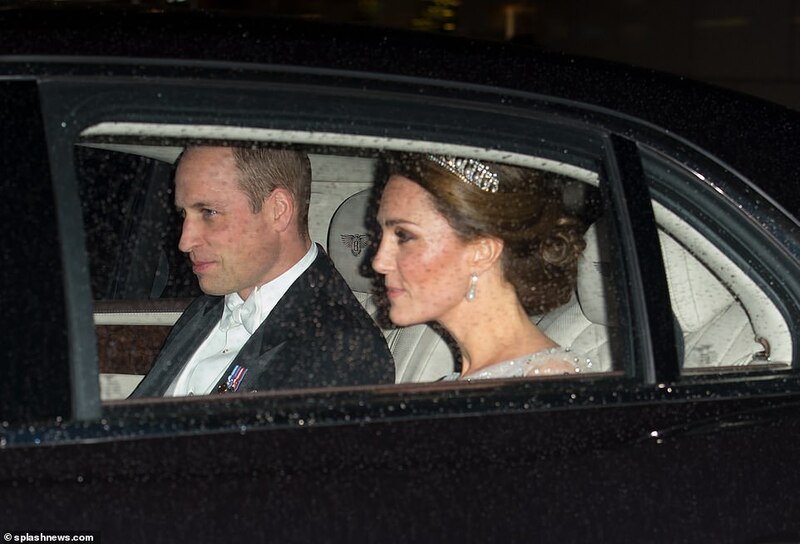 Kate, 36, joined husband Prince William, 36, the Queen, 92, and the Duke and Duchess of Cornwall for the Diplomatic Reception, an annual white tie affair and one of the highlights of the royal calendar. 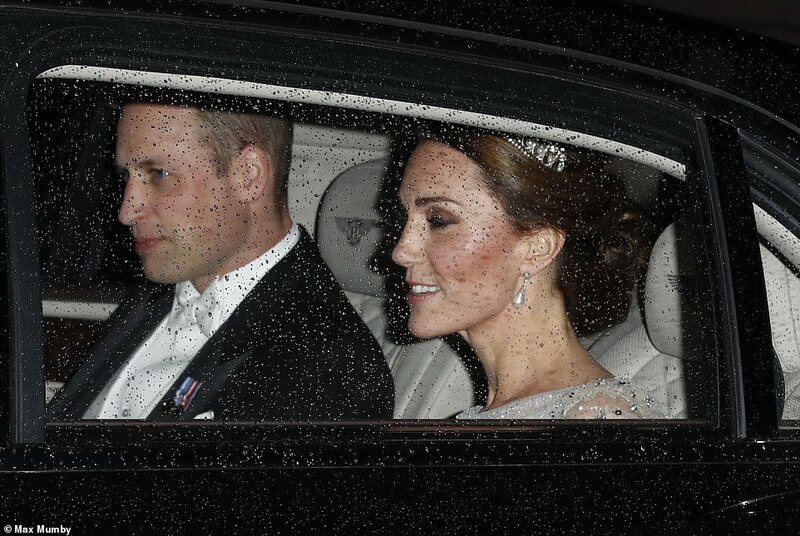 The royal mother-of-three looked breathtaking in an embellished off-white gown with a flattering cowl neck and capped sleeves. 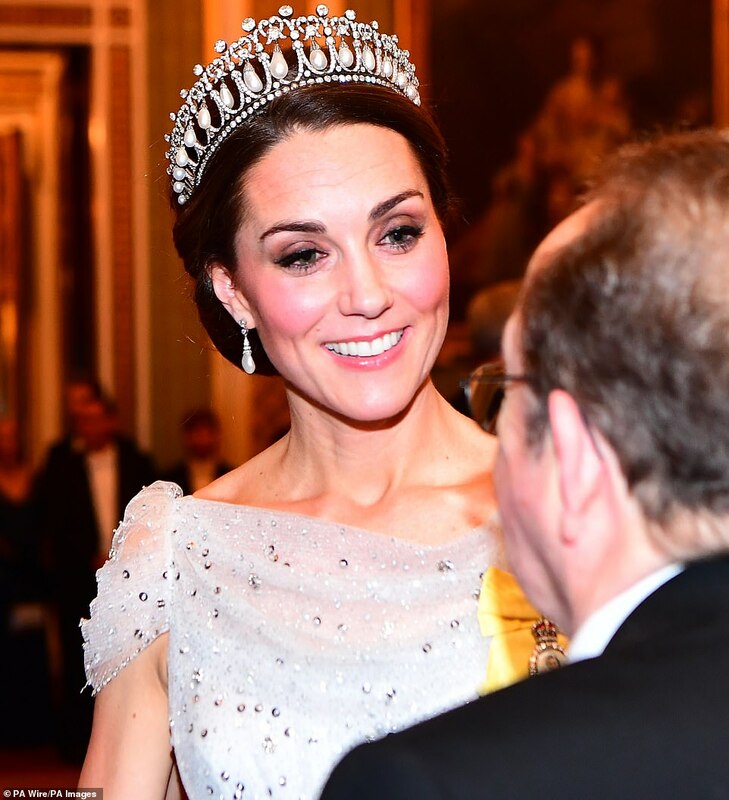 The sparkling number, believed to be a new addition to the royal wardrobe, twinkled beneath the soft lights of the Buckingham Palace rooms as Kate greeted some of the roughly 1,000 guests in attendance. 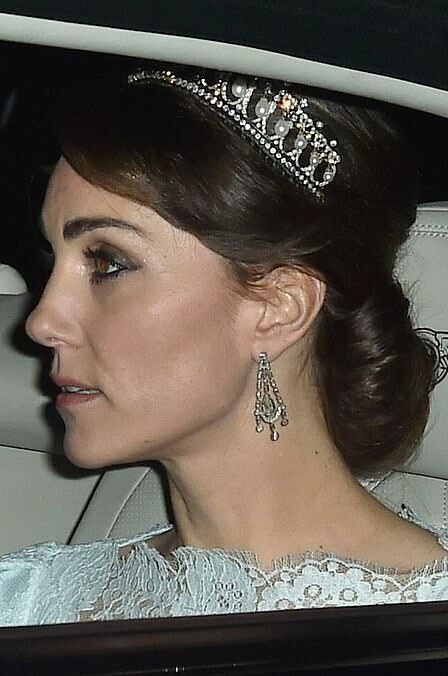 The duchess, who hosted a Christmas party for RAF families at Kensington Palace just hours earlier, accessorised with a favourite pair of pearl drop earrings and finished the look with the stunning Cambridge Lover’s Knot Tiara – a piece that she has worn on a number of previous occasions. s Kate charmed guests at the reception, the Duchess of Sussex joined her husband Prince Harry at a carol concert held in memory of a close friend of his, Henry van Straubenzee, who was killed in a car accident aged just 18. 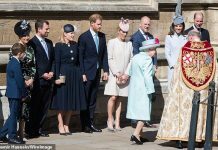 Meghan delivered a reading to the congregation at St Luke’s Church in Chelsea, which also included Pippa Middleton and her brother James, her husband James Matthews, and her parents, Carole and Michael Middleton. Rumours of a rift between the two Duchesses have swirled in recent days, following the news that Meghan and Harry are preparing to leave Kensington Palace to set up home in Windsor, at Frogmore Cottage – 25 miles from William and Kate, who live at Apartment 1a with their children, George, Charlotte and Louis. 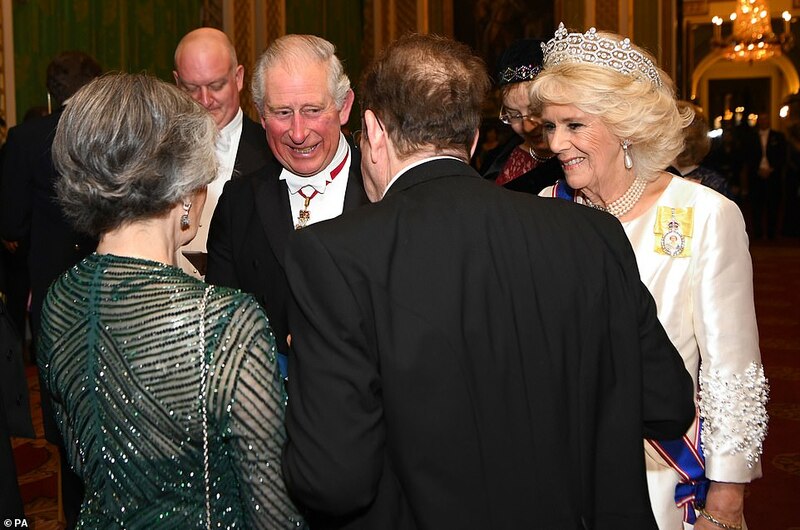 Last night’s reception also called for a quick turnaround for Prince Charles, 70, who stepped out in white tie just hours after donning a suit for a special Westminster Abbey service celebrating Christians in the Middle East. 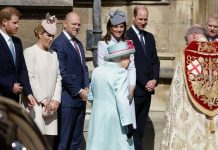 His wife the Duchess of Cornwall was the picture of elegance in a satin oyster coloured evening coat, which she wore over a dress of a similar material and slightly lighter colour. 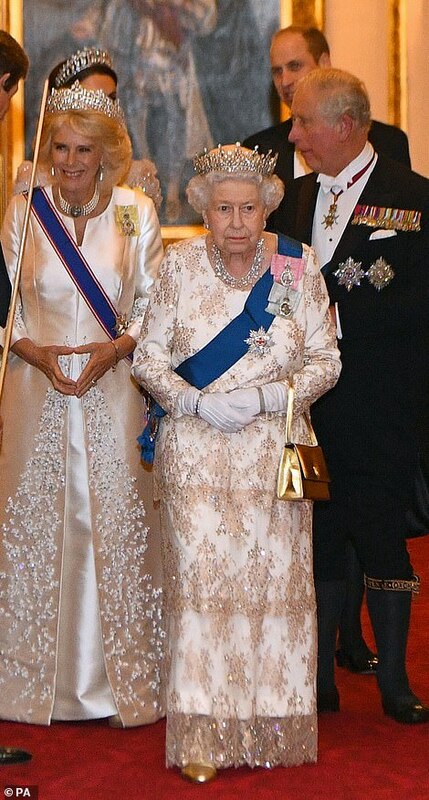 The ensemble is very similar to one worn by Camilla, 71, to the Buckingham Palace state banquet honouring Queen Maxima and King Willem-Alexander of the Netherlands in October. 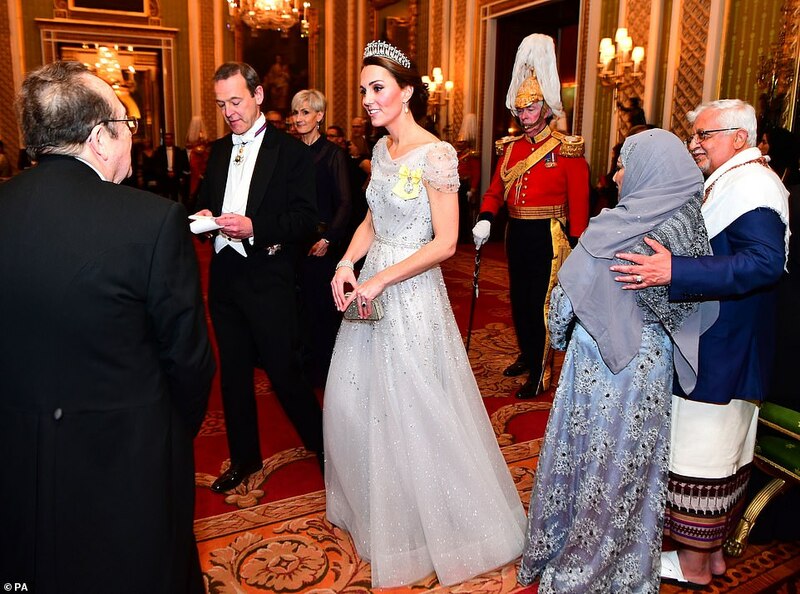 Meanwhile the Queen put on a regal display in floor-length satin gown with a delicate tiered lace overlay. 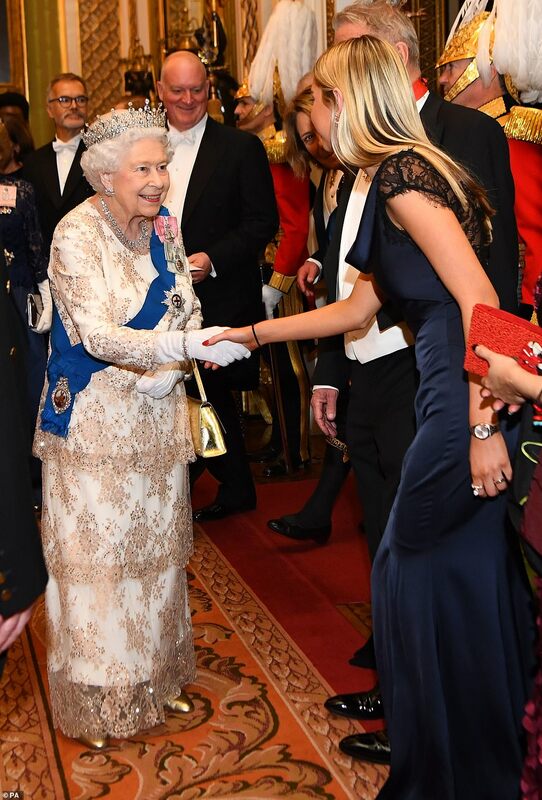 Adding to the sense of occasion, Her Majesty swapped her favoured black handbag and leather shoes for metallic gold accessories. 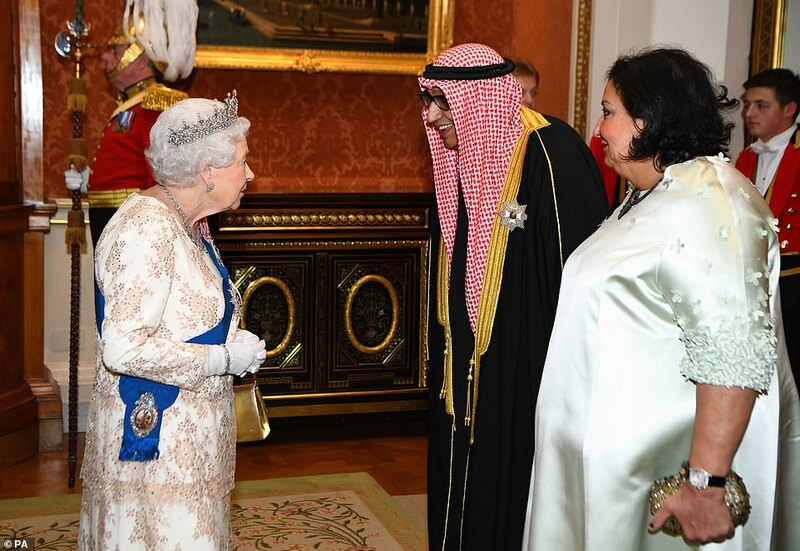 Joined by her family, the Queen appeared in excellent spirits as she greeted some of the roughly 1,000 guests invited to the reception, including ambassadors and high commissioners posted in the UK. 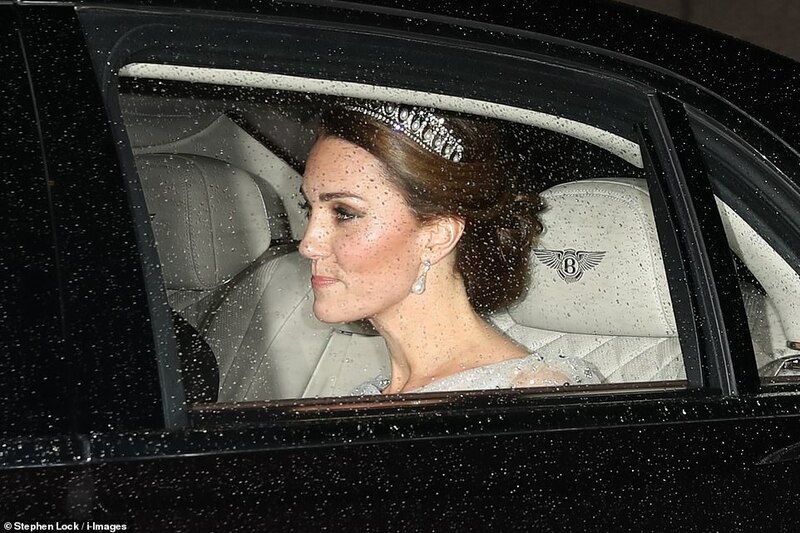 In keeping with the white tie dress code, the Queen and Camilla also wore tiaras for the occasion. 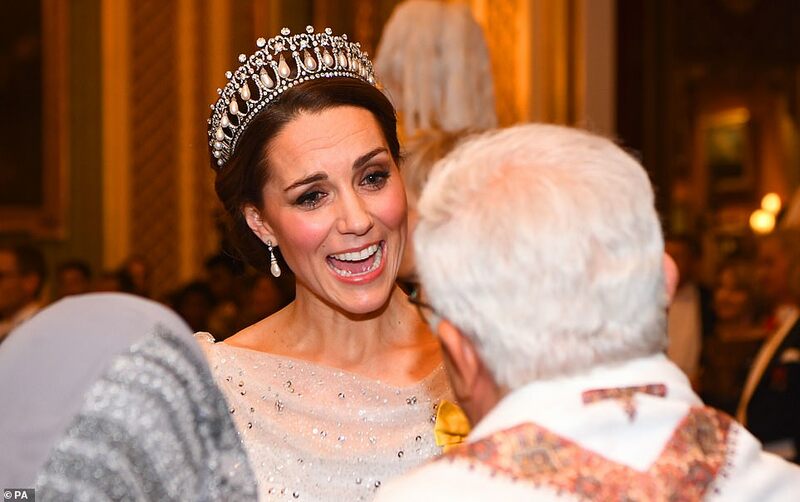 The Duchess of Cornwall sported a Boucheron tiara that once belonged to the Queen Mother while the Queen opted for another piece from the royal collection. 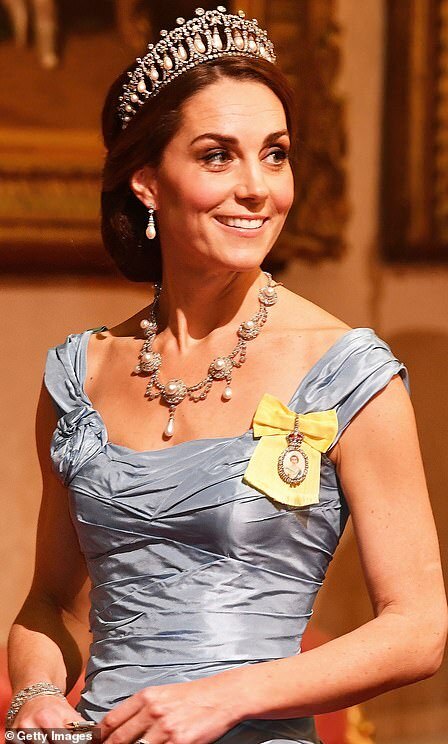 The Duchess of Cornwall and the Duchess of Sussex also sported the Queen’s Royal Order, which features a jewel encased image of the Queen pinned on a chartreuse yellow ribbon and worn on the left shoulder. The miniature portrait, painted on glass, depicts the Queen as a young woman in evening dress wearing the ribbon and star of the Order of the Garter. The image is bordered by diamonds and surmounted by a Tudor Crown in diamonds and red enamel. Its reverse, in silver-gilt, is patterned with rays and depicts the royal cypher and St. Edward’s Crown in gold. The Order is also worn by Princess Anne and the Countess of Wessex. 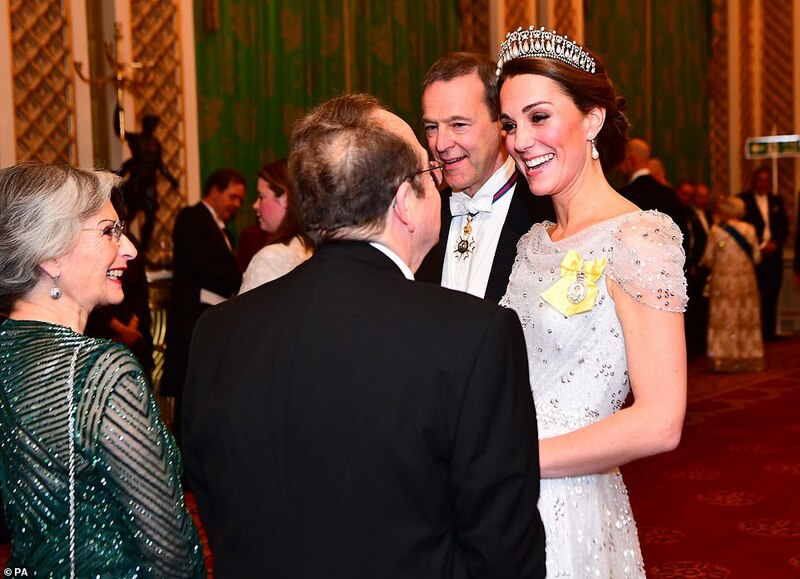 It is the only the second time Kate has been photographed in the honour, having previously worn it to the state banquet in honour of the Dutch royals two months ago. 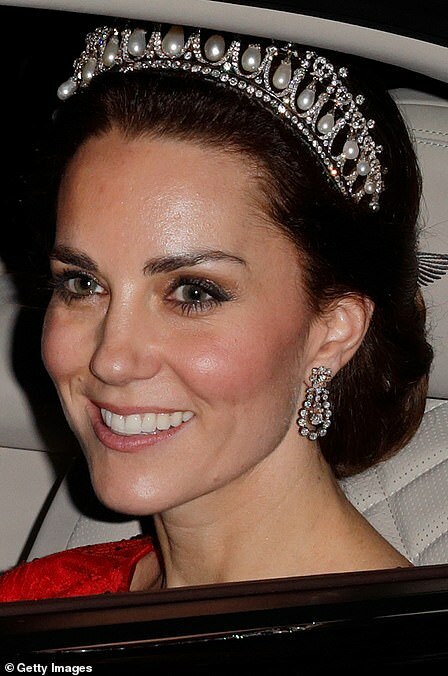 In a tribute to her late mother-in-law, the Duchess once again opted for the Cambridge Lover’s Knot tiara, which has become a clear favourite for white tie events. 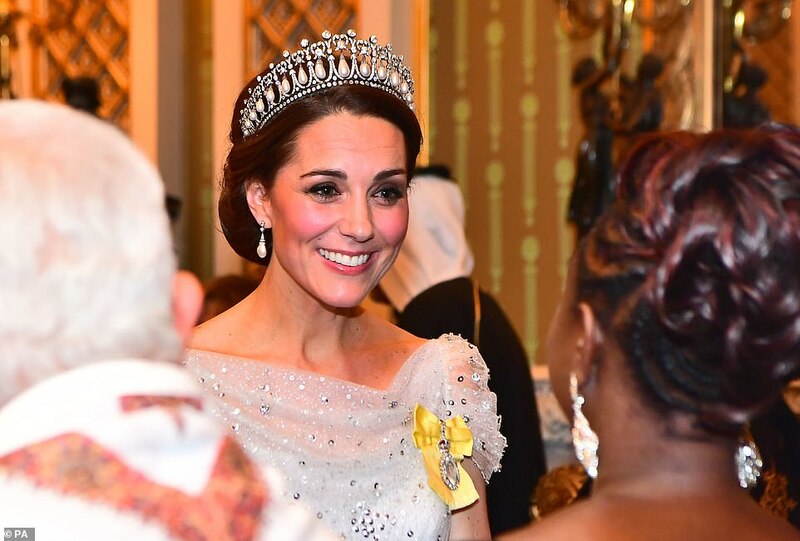 Kate also wore the tiara to the Chinese state banquet in 2015, and the Spanish state banquet and the Diplomatic Reception last year. 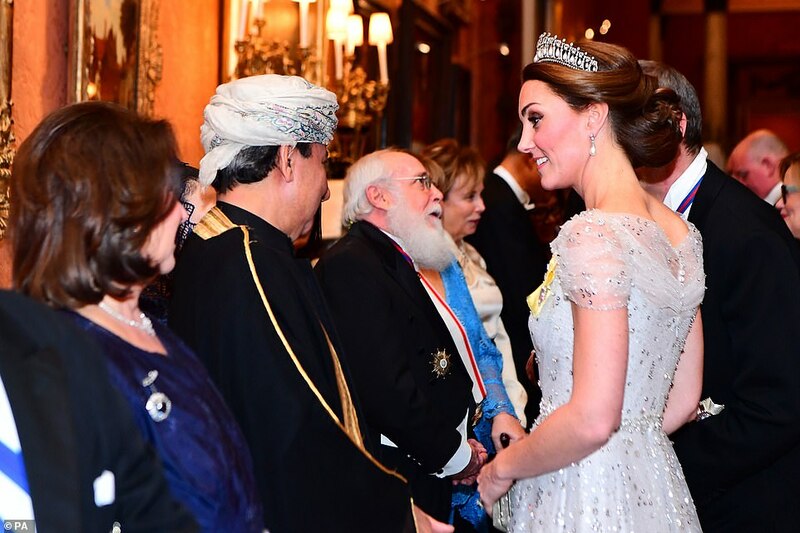 She most recently wore the piece to the state banquet held in honour of Queen Maxima and King Willem-Alexander of the Netherlands in October. 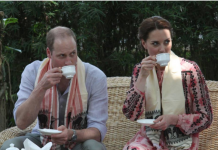 It marks the second appearance for the busy royal couple today. Earlier they threw open the doors at Kensington Palace to welcome the families of RAF servicemen and women currently deployed overseas. 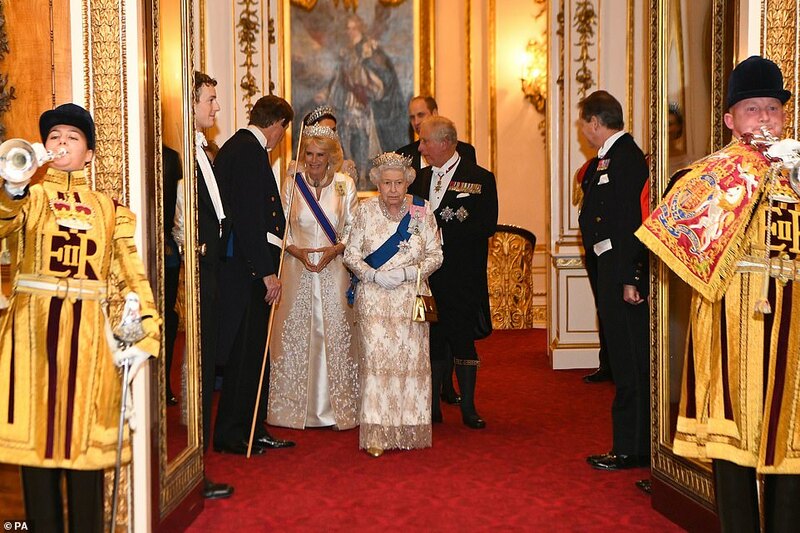 The white tie Diplomatic Reception is the main social event of the year in London for the diplomatic community and reflects the Queen’s importance in terms of the UK’s international relations. 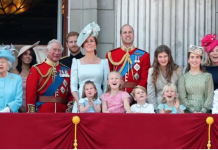 It is also the largest reception held at Buckingham Palace, requiring hours of intricate planning by the Master of the Household and the Marshal of the Diplomatic Corps, as well as the commandeering of almost every member of waiting staff. More than 1,000 people from around 130 countries, including members of the British government, past Prime Ministers and the Archbishops of Canterbury and York attend the gathering. Most notable, however, are the many hundreds of ambassadors and embassy staff officially accredited to the Court of St James, often in brilliantly coloured and eye-catching national dress.